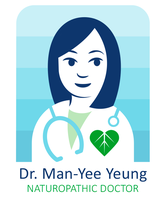 Dr. Man-Yee Yeung is a licensed and registered naturopathic doctor. She received her Bachelor of Science degree, with specialty in Biology, from the University of British Columbia. She then went on to graduate from naturopathic medical school in Toronto, Ontario at the Canadian College of Naturopathic Medicine. She is an active member of the Canadian Association of Naturopathic Doctors, the College of Naturopathic Doctors of Alberta and the Christian Naturopathic Association.